FMM Cute Car Cutter. The car is ideal as a cake topper and can also be used to decorate the sides of a cake. Set of 3 includes: 1 x car cutter & 2 x wheel cutters. This ever popular FMM rose petal cutter consists of five sizes and is used by many cake decorators to enhance their cakes. We reserve the right to refuse service to anyone. Capital letters and numbers. 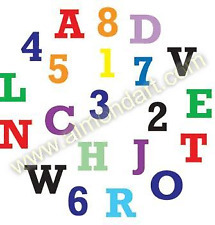 A quick and easy way to produce words and numbers using this FMM tappit. We reserve the right to refuse service to anyone. Helpful Links. 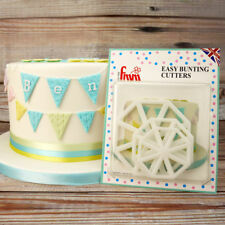 Make your own edible bunting to decorate cakes and cupcakes using this set of 3 bunting cutters by Fmm. 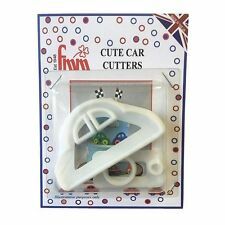 Fmm Easy Bunting Cutters, Set of 3. We reserve the right to refuse service to anyone. Available as a single set or 10 sets. Simply change the colours to create a wide variety of daffodils and nacissi with this FMM daffodil cutter. Comprises 2 pieces - Flower approx 45mm. We reserve the right to refuse service to anyone. These four endless cutters from FMM will make 8 basic border designs. We reserve the right to refuse service to anyone. 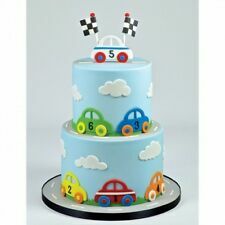 The car is ideal as a cake topper and can also be used to decorate the sides of a cake. We reserve the right to refuse service to anyone. Cute Car: 80 x45 mm approx. A quick and easy way to produce large numbers using this FMM tappit. We reserve the right to refuse service to anyone. Use this Alphabet and Number Fondant Cutter to personalise your cakes, bakes and cookies with this upper case Carnival font. The fondant strip should be placed vertically and the letter or number will be perpendicular to the fondant. 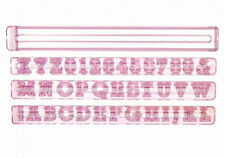 Product Details: FMM Textured Lace Set 1 is an quick and easy way to cut or emboss lace designs. Add lustre, pearl, or petal dusts to give the lace a beautiful finish. Ideal to use with sugarpaste, gumpaste and marzipan. 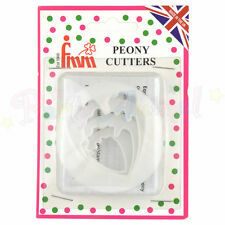 Use these cutters from FMM to create a beautiful Peony flower. Use with FMM veining mats. We reserve the right to refuse service to anyone. This lovely set from FMM contains four cutters to create and decorate a mummy and baby elephant. 4 x Mummy And Baby Elephant Cutters (2 Elephants, 2 Ears). Use the mummy elephant to create beautiful cake toppers and the baby elephant fits perfectly on the matching cupcakes. The baby feet cutters are easy to use simply roll out your sugar paste and push the cutter into the paste and gently push the feet out of the cutter. FMM Sugarcraft. ANIMAL FACE Cutter. this revolutionary all in one cutter allows you to make a. Mix 'n'Match. FMM Stars & Basket Weave. Use with Royal Icing, Buttercream & Ganache. This set contains two large stars and one basket weave tube enabling you to create beautiful baskets. We reserve the right to refuse service to anyone. 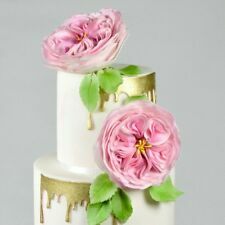 Find it difficult to get those perfect drip cakes. A VERY ENGLISH ROSE Cutter Set. Join them up to create an all round decoration, or add them to celebration cakes randomly to create a stunning look. 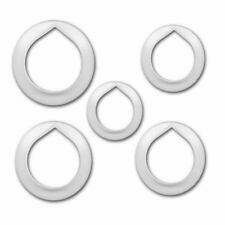 Shapes range between approx L253 x W10mm and L253 x W16mm. FMM Cutters. Both cutters are required to make a beautiful Daffodil. Wash in warm water. Party Animal Online. Want to know more about Party Animal Online?. We have a page dedicated to who we are and what we do. Product Details: FMM Blossom Cutter No.4 and 5 is ideal to create a professional beautiful flower. Ideal to use with sugarpaste, gumpaste and marzipan. Gives a clean finish and does not lose its shape. 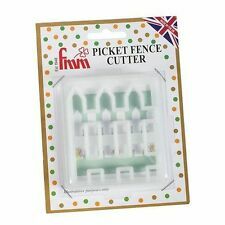 A picket fence sugarcraft cutter from FMM for creating beautiful cakes! 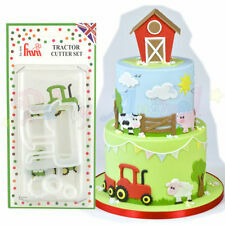 FMM is a leading manufacturer and Sugarcraft cutter specialists. They have a fabulous reputation and also do a range of brilliant shape cutters for your cake, beautiful flower cutters, as well as this wonderful Tappit range! Princess Tiara Cutters. The Small one is ideal for cupcake and large for full size cake. Large tiara 200mm x 85mm. small tiara 80mm x 33mm. use around the cake to give a cake lace effect. 2 sizes in each set. FMM Sugarcraft Ltd. UNICORN Cutter. Can also be used as a Horse. 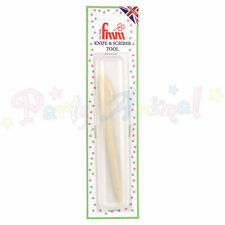 An essential set for for making flowers and leaves from FMM. We reserve the right to refuse service to anyone. The Mix N Match Face Cutter is an ‘all-in-one’ cutter designed to make an endless variety of animal faces. A huge selection of faces can be created to decorate cupcakes, celebration cakes and cookies. This knife and scriber tool from FMM is used for precision marking on the sides of cakes and opening the centre of flowers. Helpful Links. We reserve the right to refuse service to anyone. Storage & Organization. Wilton Wide Glide Rolling Pin 20" for Fondant and Gum Paste, Non-stick. Wilton Fancy Ring Mold Tin, Aluminium, Non-Stick, 10x3 in, Baking Pan Tray. Bathroom Accessories. The sizes of each shape vary from 25mm to 50mm approx. FMM Sugarcraft. DAFFODIL Flower Cutter. FMM Sugarcraft Ltd. SPLAT Cutters. Perfect for Paint Splodges and Muddy Puddles. Happy Baking. TOTALLY TROPICAL LEAVES Cutters. four different styles of leaves. Magical Unicorn Sugarpaste cutter. Make bespoke edible decorations for pretty cakes. Perfect for princess and fairy tale inspired cakes. Use to make beautifully edible and detailed fairytale inspired unicorns out of sugarpaste. With sharp, yet smooth cutting edges that you expect from FMM Sugarcraft, these tappits are easy to use and can be used to personalise a whole range of cakes and bakes. 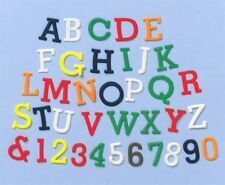 Create enchanted letters and numbers with our Magical set to decorate a whole range of cakes and cookies. This FMM cutter set creates beautiful large lillies. A classic and popular choice for many brides. The set includes veiners. We reserve the right to refuse service to anyone. Helpful Links.